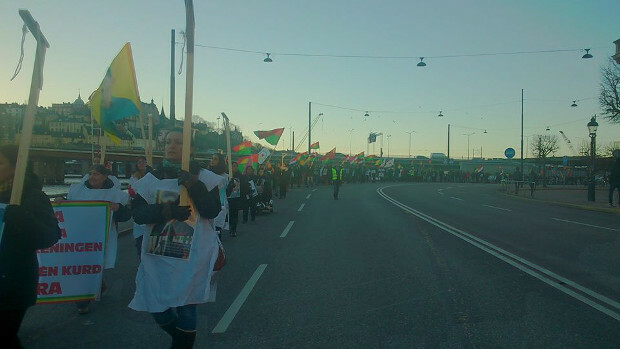 SWEDEN, STOCKHOLM – Kurds continue their protest against inhuman policies against the Iranian regime which was led to the hanging of the three Kurdish political prisoners Hebibulla Gulperipur, Reza Mamedi and Sherko Mearefi, as well as an Arab and Baluch political activist, the protest was organized by Farzad Kamanger’s Foundation and Kurdistan Human Rights Association (KMMK), in addition to the number of Kurds, Arabs and Baluch activists in Stockholm. In this protest, the Kurdish people plus Iranian regime oppositions showed their aversion against Islamic regime holding placards and martyrs photos while chanting slogans. Then speeches were given by representatives of the various parties, furthermore was stressed on the common struggles of all Iranian nations against Iran’s genocide and denial policies. The statements pointed out that while the Iranian regime, on one hand talk about a democratic and political opening and also improvement of international relations, on the other hand we are witnessing the new government that has taken an aggressive approach against the various ethnic minorities of Iran, primarily inside Iran and especially eastern Kurdistan.